Evergreen hedges and screens are popular features in many gardens. They provide privacy for homeowners and give definition to garden designs. Fast-growing trees are especially popular for this purpose. Two outstanding performers are "Spartan" Chinese juniper (Juniperus chinensis "Spartan") and emerald green American arborvitae (Thuja occidentalis "Smaragd"). Both of these different plants are excellent tall hedge and screen evergreens, but understanding the similarities and differences of these trees can help you select the best one for your needs. "Spartan" juniper reaches 20 feet in height and spreads 4 to 6 feet in width. The tree makes an excellent medium hedge or screen as well as an attractive ornamental specimen. "Spartan" juniper doesn't require shearing to keep its size, but responds well to pruning if you desire to keep it smaller. Emerald green arborvitae is a wider tree. It also grows 20 to 30 feet tall, but it spreads to 8 feet without shearing. Because arborvitae often splays open with age, they look best with light trimming. Emerald green arborvitae grows about 4 feet per year to maturity, while "Spartan" juniper grows 12 to 18 inches annually. Emerald green arborvitae, also known as emerald green juniper, prefers full sun instead of the partial sun. Emerald green juniper grows in any soil type, even rocky soil and clay soil. The tree adapts to any moisture level from dry to quite moist. Hardy in U.S. Department of Agriculture plant hardiness zones 3 through 7, it tolerates most conditions except shade. "Spartan" juniper tolerates partial shade but looks best when grown in full sun. It's not particular about soil characteristics, as long as the soil is well-drained soil. "Spartan" juniper is hardy from USDA zones 4 through 10. Spartan juniper grows into a perfect pyramid with a graceful waving top. It is a thickly set tree that keeps its shape well. The natural grace of its form makes it a perfect tree for a formal specimen or a beautiful screen. Emerald green arborvitae curves softly at the crown, but can be sheared straight across for a strict hedge. The emerald green plant provides a thicker silhouette but may struggle to keep its form at the top if left natural. Often the top is tied on the interior so branches can't splay out and spoil the shape. Emerald green arborvitae often has more than one trunk, while "Spartan" juniper grows with a clear central leader. Both "Spartan" juniper and emerald green arborvitae have scale-type leaves at maturity, but the juvenile juniper has awl-shaped needles until it matures. Arborvitae leaves grow more closely together and almost hides its stems. "Spartan" juniper has a looser foliage habit which allows the skeleton of the tree to sometimes show. 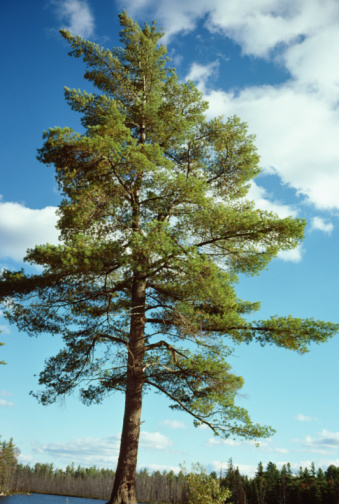 The two trees each bear cones, with the juniper cones growing slightly larger and starting out a bluish green. Each tree's cones mature to light brown. 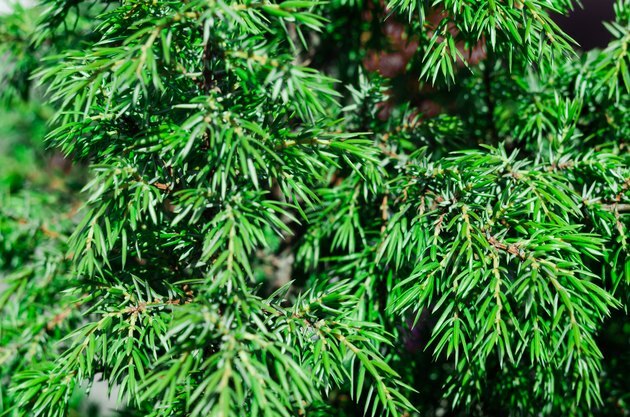 The emerald green arborvitae has reddish-brown bark and the juniper has brown bark that sloughs off in strips. Both plants perform well in the low-maintenance garden. Junipers are considered to be the largest range of any type of plant in the world, with many of the species being native to North America. Junipers are very fragrant, so they are often used as Christmas trees during the Christmas season. Another fun fact is that Gin actually has a close association with Junipers. Gin is short for the Dutch word for juniper which is genever, which is the main flavoring of Gin. Many Native Americans actually used Juniper for medicinal uses. Canadians brew a tea out of the needles of Arborvitae. The word Arborvitae is actually Latin for "tree of life." The needles are rich in vitamin C and helped to prevent scurvy and topically treated warts, ringworm, and thrush. How Fast Does a Burning Bush Grow?